Leo Fender’s Stratocaster has defined the sound of Blues, Rock ‘n Roll, Country and Surf since it’s introduction in 1954. 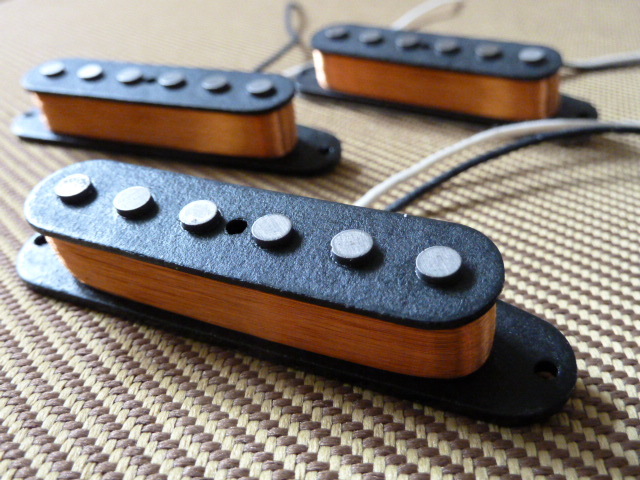 My Strat replacement pickups are true hand wound reproductions and can be fully customized to your taste. Magnets can be staggered standard, with a tall G, all flat with a raised D (for necks with a flatter than 10″ radius) or left handed like Jimi. There are three outputs to choose from. – STANDARD– pickups can be wound from 5.75 K to 6.7 K using 42 AWG Heavy Formvar wire. – OVERWOUND– pickups can be wound from 6.1 K to 7 K using 42 AWG Single Poly Nylon wire. 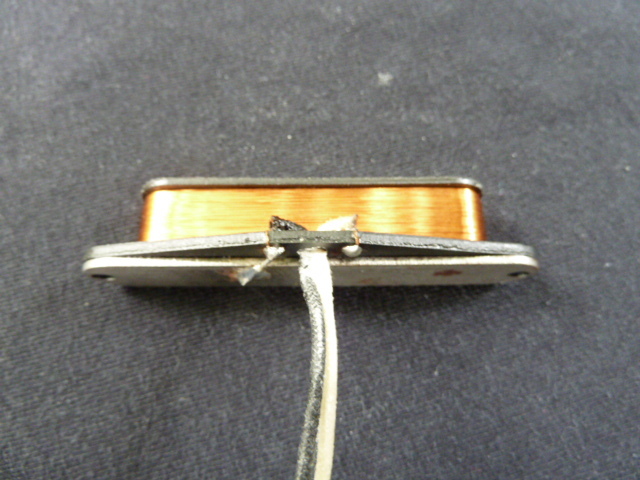 – EXTRA HOT– pickups can be wound from 8 K to 10 K using 43 AWG Plain Enamel wire. – AlNiCo V or AlNiCo II magnets or 1/2 & 1/2 (AlNiCo II on the E, A, and G strings, AlNiCo V on the D, B, and E strings. This will brighten the sound of a Strat that has dark and dull sounding wound strings). Grey bottom strat pickups typically have AlNiCo V magnets, are wound with 42 AWG Plain Enamel wire to 5.75 K neck, 5.75 K mid, and 6.3 K bridge, but can be customized to your specs. AlNiCo II magnets, different wire, or different output levels are available upon request. – All sets come with a Reversed Wound/Reversed Polarity middle pickup unless other wise suggested. – Covers are included. Choose from white, black, mint green or antique white. 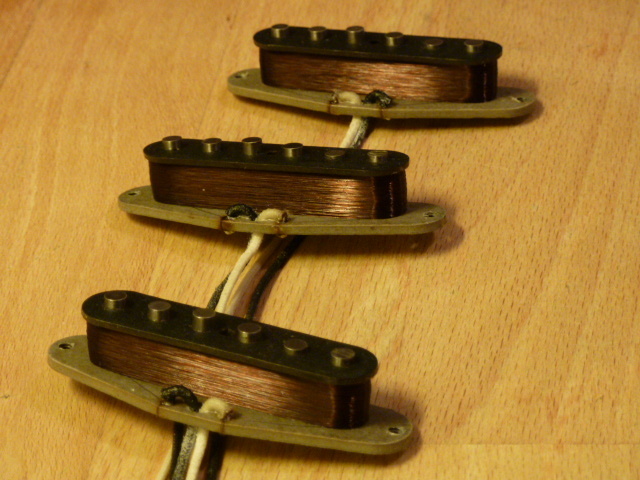 A bass plate can be added to strat bridge pickups. This gives the pickups 10% more bass without affecting the mids or highs. This will give a strat bridge some telecaster bridge pickup character. Stratocaster, Strat, Telecaster, Tele, Jazz Bass and P-Bass are registered trademarks of Fender Musical Instruments. This entry was posted on 06/09/2010 at 13:38 and is filed under Tyler's Products. You can follow any responses to this entry through the RSS 2.0 feed. Both comments and pings are currently closed.